Portobello Market has been one of London’s top attractions for over 100 years and is a great place to spend an entertaining day. Over the years the market has grown significantly and is now home to more than 2,000 different traders selling all sorts of items and produce. Portobello Market offers a great mix to things you can buy. Initially it started as purely antiques market but now it sells a variety of products and produce. Nowadays, the area between Portobello Road to Chepstow Villas and Elgin Crescent is where you’ll find the world famous antiques section, close to the Notting Hill tube station. There are literally thousands of items on sale, including vintage glass and crystal objects, silver objects, home decor, vintage clothes and accessories, as well as books and manuscripts. No matter what period of history shoppers enjoy, there will be something to appeal for everyone. 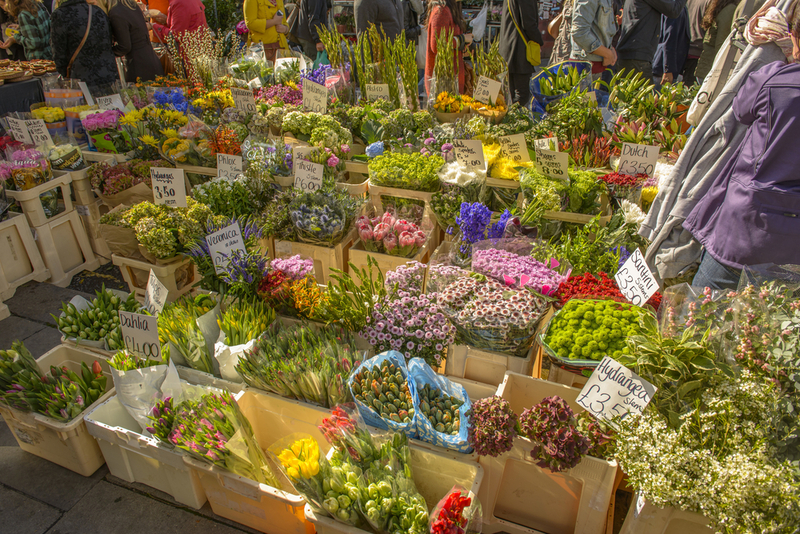 If you head to the market between Elgin Crescent and Talbot Road, then the antiques are replaced with stalls selling fresh fruits, vegetables, breads, cakes, fish and cheese. There is a rich mix of cuisine to choose from including local produce, international spices and delights. One of the most interesting stretches of the market is between Talbot Road and Westway, where you’ll see pretty much everything available for sale, ranging from toys to superglue. This part of Portobello probably has a lot in common with London’s other famous street venue – Camden Market. For those more interested in fashion, the Westway area of the market is the ideal destination. Stalls here sell a unique collection of vintage clothes on sale. The larger retailers have some great and beautiful vintage clothing, but there are also some new pieces available from up-and-coming designers, who chose Portobello Market as their first step into the world’s fashion scene. Finally, the Westway to Golborne Road area is dedicated to second-hands of all kinds, including books, DVDs and electronics. It has the atmosphere of a typical British market and there are plenty of opportunities to pick up a bargain or two. Portobello Market stretches over two miles, and walking the whole length can take a whole day if you have an interest in everything on offer. It comprises of hundreds of stalls and a similar number of shops and boutiques. Such is the nature of Portobello that it is never the same twice, with new traders coming in all the time. Even if you’ve been before, you’ll be treated to a very different experience to last time. As well as the shopping and street food, there is also some great street entertainment, with a number of performers doted along the market routes to entertain you. Apart from a great shopping experience, the market offers a great selection of food too. Make sure you spend some time checking out the musicians, living statues and dancers on the streets. To see the best entertainment, it is best to head to the market on Saturday. On Saturday’s the market is the most lively and buzzing. The market is open from Monday to Saturday, but its actual opening hours differ depending on what day it is. From Monday through to Wednesday, you’ll find traders here from 9am until 6pm, but Thursdays are half-days and traders are only open from 9am until 1pm. Fridays and Saturdays are for late night shopping, as the Portobello Market opens from 9am until 7pm. The busiest day is Saturday because the antique and bric-a-brac stalls are open along with some multi-cuisine food stalls – if you want to avoid the crowds it can be worth arriving before the official opening hours as some traders do sometimes open up early. If you plan to travel to the market on the London underground then the best option is to head to Ladbroke Grove station (Hammersmith and City line) or Notting Hill Gate (Central, Circle and District line) station. The latter is slightly nearer and does offer a pretty walk up to the start of the end market. Alternatively, if you prefer the mainline train network then head to Paddington Station – which is around a 25 minutes walk away from the market. There are also plenty of buses that pass by the market including routes: 7,12, 23, 27, 28, 31, 52, 70, 94, 328 and 452. West London hotels offer a really good base for visitors to London, especially if it is the first visit to the city. They are also well-placed for a visit to Portobello Market, especially if you plan to get there early before the market gets really busy. Consider the Park Grand London Paddington if you want somewhere that offers great accommodation and is well-placed for many of the sights and sounds of the English capital. Share the post "A guide to Portobello Market"